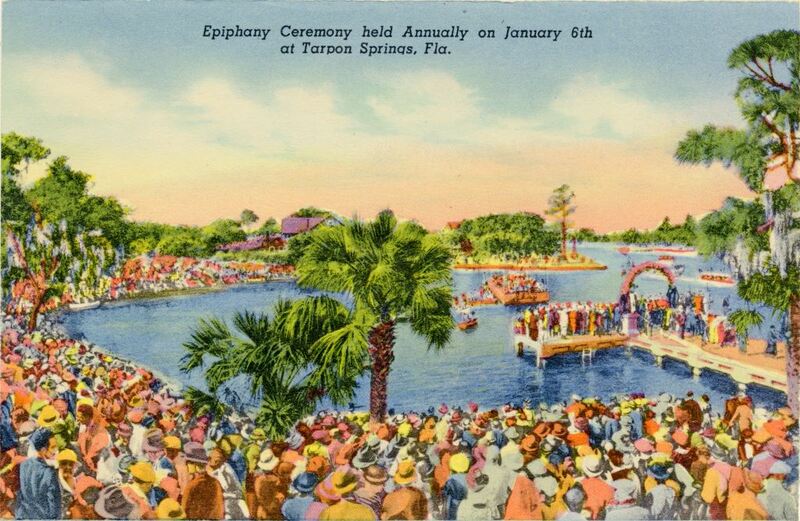 A postcard depicting a ceremony held each year on January 6 for the Epiphany in Tarpon Springs, Florida. Epiphany, also known as Three Kings' Day, is a Christian holiday celebrating the baptism of Jesus of Nazareth. Known for its large Greek population, Tarpon Springs began celebrating Epiphany in 1902. "Tarpon Springs Epiphany Tradition." SpongeDocks. http://spongedocks.net/tarpon-springs-epiphany.htm. Gulf Stream Card and Distributing Company. 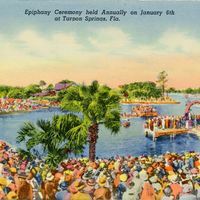 “Epiphany Ceremony Held Annual on January 6th Postcard.” RICHES of Central Florida accessed April 18, 2019, https://richesmi.cah.ucf.edu/omeka/items/show/6705.